A recent extension to our range of services is a showroom based in Margate, Kent, offering a wide choice of products made to our high quality standards for small home interiors and properties. Not every space needs a fully bespoke service, but every homeowner likes to feel the products they put into their home are made to a high quality and will last the test of time. We have poured all of our decades of experience into a range of home interior products, made to standard sizes and styles but using a range of gorgeous fabrics and made to the kind of high quality finish rarely seen in the market today. 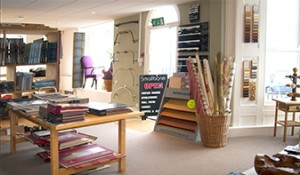 We also have on display and available to supply from stock a large variety of ready-made products from most of the major suppliers and manufacturers including Brintons Carpets, Cavalier Carpets, Victoria Carpets, Gaskell Mackay Carpets and Alternative Flooring Company. Over thirty years of expertise working with some of the most demanding specifications in the world goes into every product we create for our shop. We believe in taking time to make a unique product that only an individual retailer can supply, but still available at a competitive price ideal for small home interiors and the domestic market. Located at 11-15 Albert Terrace, Margate, Kent, the showroom is easily accessible from across the county and is open Monday to Friday, 10am to 4pm every week. Our showroom staff are always on hand to provide the personalised customer service we take pride in, and help you find the ideal piece for your home. So for something a little different, with no compromises made on quality, drop into the showroom or contact us at any time to see just what we have on offer that may look beautiful in your home.